In the colder months, for me, it's all about keeping my hair sleek and polished, but as soon as the weather gets warm I'm all about beachy texture and that kind of undone, easy going look. To get that, for the past several years I've been using a salt spray to add texture and definition to the hair and to help maintain waves after drying it in a braid or bun. 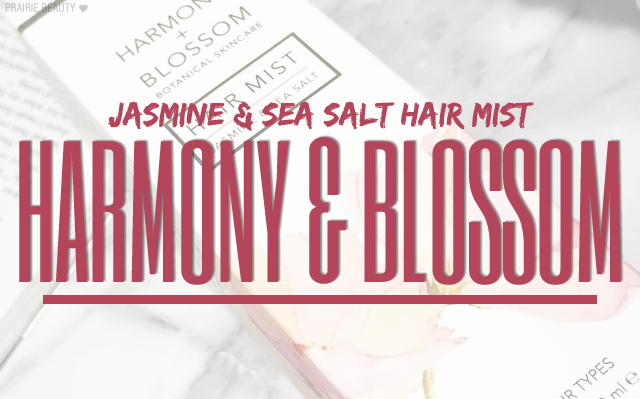 So clearly I was excited to try out the Harmony + Blossom Jasmine & Sea Salt Hair Mist*. I've tried a lot of salt sprays in my hair, some with great results and others not so great, so I was looking forward to seeing how this one stacked up. 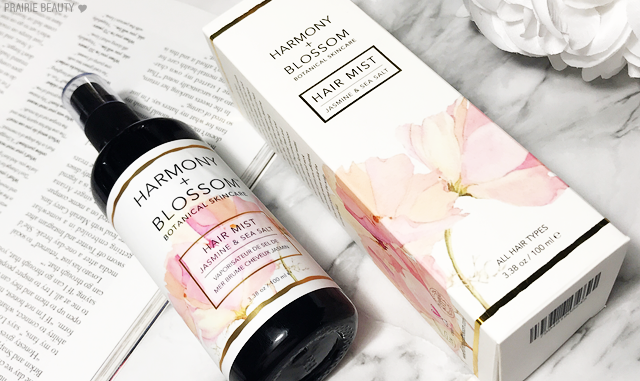 If you're unfamiliar with Harmony + Blossom, it's a female founded Canadian brand that was started to encourage women to focus on self care. Clearly all of these things are huge plusses in my book, since I love supporting women owned brands, Canadian brands, and I'm a huge advocate for taking time in your life to practice self care. As women, I think a lot of us end up focusing on our care for others more than ourselves, so it's important to set aside some time in your day to do something just for you - for me, and many other women, that can really be a beauty regimen that makes you feel good. This naturally fragrant Jasmine Sea Salt Hair Mist will bring vitality to flat, limp hair and leave hair looking fresh and voluminous. 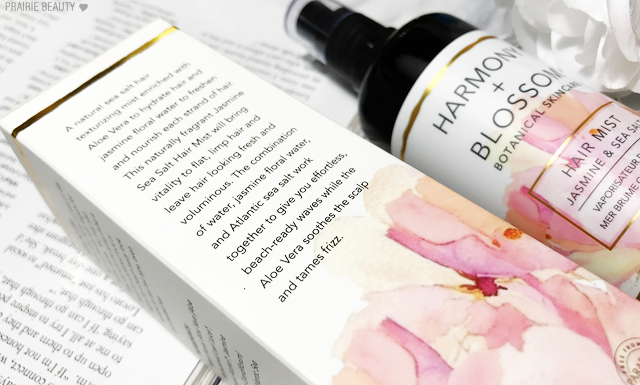 The combination of water, jasmine floral water, and Atlantic sea salt work together to give you effortless, beach-ready waves while the Aloe Vera soothes the scalp and tames frizz. 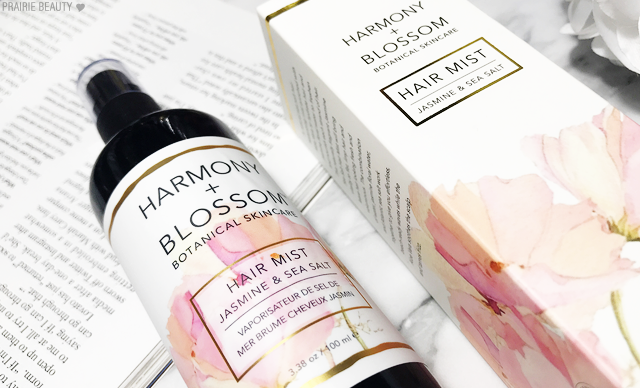 The first thing that struck me about the Harmony + Blossom Jasmine & Sea Salt Hair Mist* (adter the beautiful branding and packaging design) was the scent. I'm a bit obsessive about the smell of the products I put in my hair and I immediately wanted to put this floral mist into my hair if only for the scent of it. This is definitely not your grandmother's floral, but it's quite a strong scent so if you don't like scented products or specifically don't like the scent of jasmine I would say this might not be for you. It is definitely for me though and I love getting a whiff of my hair throughout the day when I use this product. One issue that I tend to have with salt spray is that it can be very drying, but I feel like the addition of the aloe to this formula helps to balance that out and I don't find this to be overly drying it my hair. That said, I do add some hydration to my hair with an oil after washing and then apply this to dry hair so that I'm getting the best of both worlds. This product dispenses in a really fine mist and I feel like it really doesn't overwhelm the hair when applied. I like to hold it about 12-18 inches from my hair to really disperse the product and then scrunch and twist my hair between each spray to get the most texture. 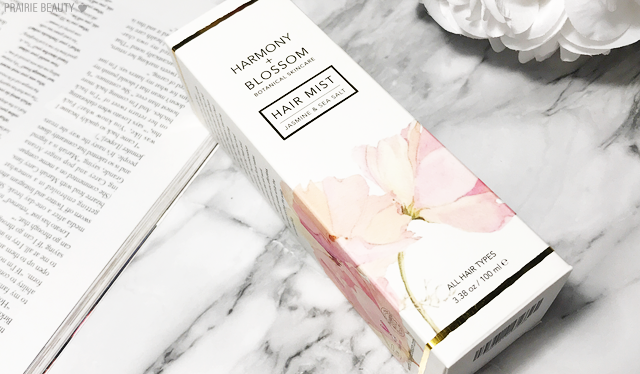 This definitely isn't a sticky or crunchy hair mist and once it's dry I find that it offers really lightweight light hold that gives some texture without it looking or feeling like you have product in the hair. As far as adding texture, I would say that this is sort of medium. It'll add definition to what you have but it isn't going to add a bunch of waves to straight hair or anything like that. I also thing it's important to not fuss too much with this. Apply it, work it in and then leave it alone because it is so lightweight and doesn't add a lot of hold, it can end up losing its hold once you mess with your hair too much. Overall, I feel like this is a nice salt spray and I will definitely continue to use it throughout the summer to get that easy going texture that I love so much during the warmer months, but I don't think I would personally buy it again because this isn't the type of product that I prioritize at a luxury price point. For me, the scent is definitely my favorite thing about this because it's so delicate and lovely to me and I really enjoy that it lingers in my hair and provides a nice smell to me throughout the day. I would recommend this for someone who's looking to add texture without heaviness or overdrying, particularly someone who already has wavy or curly hair and just wants to get a little bit of definition and hold. If you're like me with pin straight hair, this definitely works best after adding some wave to the hair with braids. 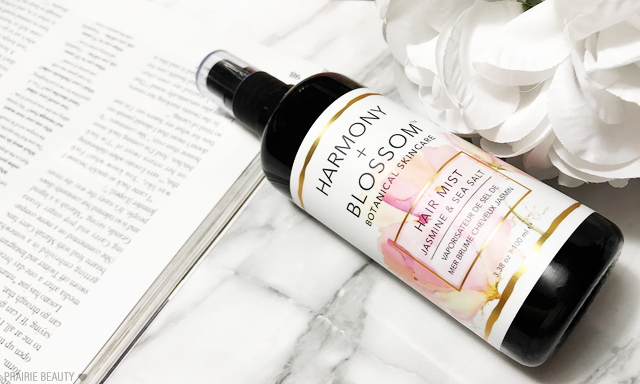 The Harmony + Blossom Jasmine & Sea Salt Hair Mist* is available online at their website and retails for $60CAD, so it is quite a luxury hair product.